After the death of Anko Itosu in 1915, one of Itosu's most senior students, Choshin Chibana, wanted to continue to teach the Shorin-ryu style of karate he learned from his instructor. Chibana named his system Shorin-ryu, but using the Chinese characters for "small" and "forest" . Chibana lineage schools are commonly referred to as "kobayashi", but this is technically incorrect, as Chibana never used the term to refer to his karate. It was meant to be “Shorin” as tribute to the Shaolin temple (Shorin is the Japanese/Okinawan pronunciation of Shaolin). However, he believed strongly that Shorin-Ryu was largely Okinawan and purposely modified the first character from the Chinese "Shao/Sho" so it would retain its originality. As other schools later adopted the name "Shorin-ryū", the term "kobayashi" was probably added to describe which exact characters were used to write the term "Shorin", but was never meant to be the official name of the style. Naonobu Ahagon began training with Chibana Sensei in March 1957. Ahagon Sensei was of the last students to train with Chibana Sensei before his passing in 1969. 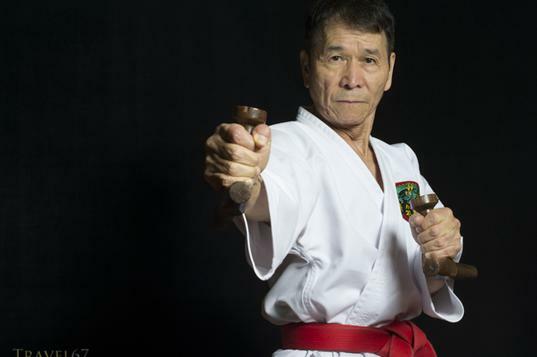 In 1991, Ahagon Hanshi established the Okinawa Karate and Kobudo Shorin-ryu Reihokan Association, after training with Shuguro Nakazato for 30 years. "Reihokan" is translated as "treasure house" or "way of the peaceful people." Ahagon Sensei was awarded 10th Dan in karate and kobudo in November 2007. Ahagon Sensei currently serves as Okinawa Karate and Kobudo Shorin-ryu Reihokan Association president, Okinawa International Martial Arts Karate League president, Okinawa Traditional Karate-do Council director, Okinawa Karate & Kobudo League vice-president and Dan grade examination committee chairman, as well as president of Okinawa Prefecture Naha City Karate-do Association. Photo by Chris Willson, 2014.